(CBS) DETROIT - Two young children watched as a man fatally shot their mothers and another person inside an abandoned Detroit home, CBS Detroit reports. According to the station, the children spent the night with the bodies before help arrived, one of the victims' relatives says. 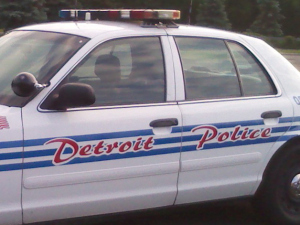 Neighbors reported hearing gunshots Wednesday night at or near a house on Detroit's west side. The next morning, a neighbor made the gruesome discovery inside the house - three people had been shot to death and two children, ages 5 and 1, were left abandoned, the station reports. Police say they received calls reporting the gunshots Wednesday night, but were given the wrong address and therefore did not arrive at the correct address until new calls came in the next morning. Police identified two of the victims as 25-year-old Lauren Trotty and 20-year-old India Coleman. The third victim, 25-year-old Curtis Clements, was identified by family members. Police said all of the victims appeared to have suffered from gunshot wounds, but provided no additional details. Reports say a shotgun was used in the killings. Kenyetta Hunt, a relative of Clements, told reporters Trotty's 5-year-old child witnessed the shooting and identified the shooter as her mother's ex-boyfriend. The toddler also reportedly said the 1-year-old, Coleman's child, witnessed the shooting as well. Detroit police say they have made one arrest in the case, although that person's identity was not immediately released. An investigation is ongoing. CBS Detroit reports the city has thousands of vacant homes, many of which are a magnet for crime.